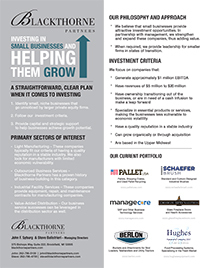 Blackthorne Partners believes that small businesses provide attractive investment opportunities. We can create value by building these companies in partnership with management. When required, we provide the leadership that is sometimes needed at smaller firms in a state of transition. Outsourced business services. Blackthorne Partners has a proven history of business building in this category. Light manufacturing. These companies typically fit our criteria of having a quality reputation in a stable industry. We also look for manufacturers with limited economic vulnerability. Value-added distribution. Our business service successes can be leveraged in the distribution sector as well.